Get some cultural insight at National Museum of Anthropology (Museo Nacional de Antropologia) and Palacio de Bellas Artes. Step off the beaten path and head to Coyoacan and Chapultepec Castle. You'll find plenty of places to visit near Mexico City: Tepozteco (in Tepoztlan), Robert Brady Museum (in Cuernavaca) and Xochicalco (in Miacatlan). Spend the 3rd (Wed) exploring nature at Cumbres Del Ajusco National Park. There's still lots to do: take an in-depth tour of Museo del Templo Mayor, contemplate the long history of Basilica de Santa Maria de Guadalupe, make a trip to Paseo de la Reforma, and admire the striking features of Metropolitan Cathedral (Catedral Metropolitana). To see maps, other places to visit, traveler tips, and tourist information, go to the Mexico City trip app . If you are flying in from Mexico, the closest major airports are Licenciado Benito Juarez International Airport, Querétaro Intercontinental Airport and General Francisco J. Mujica International Airport. In June, daytime highs in Mexico City are 28°C, while nighttime lows are 16°C. Finish your sightseeing early on the 3rd (Wed) to allow enough time to travel to Madrid. 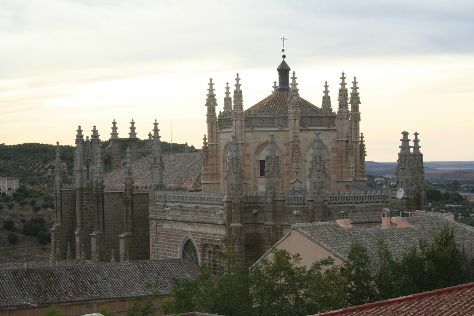 Your cultural itinerary includes sights like Monastery of San Juan de los Reyes and Royal Palace of Madrid. Escape the urban bustle at Retiro Park (Parque del Retiro) and Playa del Alberche. Explore the numerous day-trip ideas around Madrid: Toledo (Church of Santo Tomé, Catedral Primada, & more), Segovia (Catedral de Segovia & Alcazar de Segovia) and Avila (The Four Posts, Basilica de San Vicente, & more). There's much more to do: see the interesting displays at Prado National Museum, make a trip to Plaza Mayor, explore the world behind art at Museo Nacional Centro de Arte Reina Sofia, and take a stroll through Gay Madrid & the Chueca District. To find other places to visit, maps, photos, and more tourist information, read Madrid trip builder website . You can fly from Mexico City to Madrid in 15.5 hours. Alternatively, you can do a combination of bus and flight. You'll lose 7 hours traveling from Mexico City to Madrid due to the time zone difference. Prepare for a bit warmer weather when traveling from Mexico City in July: high temperatures in Madrid hover around 40°C and lows are around 23°C. On the 13th (Sat), wrap the sightseeing up by early afternoon so you can travel back home.